Banished to a mysterious underground labyrinth of complex mazes, two explorers are faced with one chance to reverse the curse: solve all 100 puzzles set out in mazes before them. But watch it! Every maze has monsters patrolling the depths of the labyrinth. 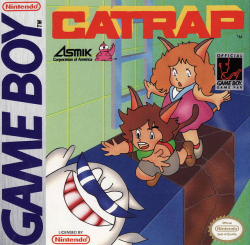 Help Catgirl and Catboy push around huge blocks to bridge a path to yet another maze, or topple a block a few stories over the pursuing monsters. If you make a mistake, simply use the rewind function and travel back in time to correct it. With 100 mazes in this labyrinth, it will be quite a challenge to get out of the curse's reach!